We decided to go with barcodes down the hallway. Weird, I know, but I like to be different. 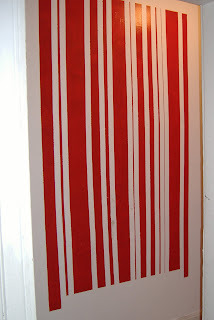 I got the idea while watching a design show where they put stripes of varying sizes on a guy's wall. Though the design on the show was just stripes, I decided to take it a bit further and turn them into barcodes, complete with numbers. With all the taping involved, it's turning out to be a long project, especially with our peeling walls. Peeling walls are nobody's friend. Thankfully our problem is isolated to a small area so I can fix it in patches. So far I like the barcodes. For numbers, Jerome and I came up with dates that mean something to us and I'll stencil them on the bottom after all the UPC's are up. I'm still trying to decide what color I want the trim. Originally, it was going to be black. Black, red, and white are the three colors that pop up in the our three main rooms so it made sense to carry them through the hallway. That said, I don't think the black is working for me. We'll see what happens with that. I'm still working on that stupid light fixture in the dining room. Turning a lamp into a chandelier is pretty darn easy. All you have to do is cut the lamp cord, split the two wires, and strip the plastic from the ends. From there, you need to TURN OFF THE ELECTRICITY from your fuse box and simply connect the wires to the wires in your ceiling using the end caps. Of course, I couldn't have it that easy. Whoever put up the original light in the dining room didn't do the best job and has some interesting wiring going on in the ceiling. I tried to take it out and insert a new electrical box, but the old one is so old and rusty it won't come out. I tried to use the box they already have but the screws are too short. I tried getting new screws at Home Depot, but they're a weird width that is no longer stocked. The day I get this light hung up will be the best day of my life! I'll probably have a party to celebrate!